... that the Corythosaurus (mounted skeleton pictured) bore a tall, elaborate bony crest atop its skull, which contained elongate nasal passages? ... that British archer Sharon Vennard competed at the 2012 Summer Paralympics despite being in constant pain due to osteoarthritis in her spine? ... that in a 1966 interview John Lennon remarked that the Beatles were "more popular than Jesus"? ... that the Vietnamese Nôm Preservation Foundation in Cary, North Carolina, has been preserving the ancient Chữ Nôm script of Vietnam since 1999? ... that pianist Werner Genuit played the complete works for piano by Richard Wagner for the national congress of the Wagner Society? ... that Ludian was a courier station on the Ancient tea route? ... that the inner part of Stanford University's Main Quad is surrounded by twelve buildings, numbered 1 through 110? The 41st Chess Olympiad concludes with China winning the open section and Russia winning the women's section of the tournament. Mathematicians Artur Avila, Manjul Bhargava, Martin Hairer, and Maryam Mirzakhani are awarded the Fields Medal; Mirzakhani (pictured) is its first female recipient. Actor and comedian Robin Williams dies at the age of 63. Recep Tayyip Erdoğan wins Turkey's first direct presidential election. Sepahan Airlines Flight 5915 crashes near Mehrabad International Airport in Tehran, Iran, killing 39 people. Khmer Rouge leaders Nuon Chea and Khieu Samphan are found guilty of crimes against humanity by a UN-backed tribunal. 1612 – The trials of the Pendle and Samlesbury witches, among the most famous of England's witch trials, began at the assizes in Lancaster. 1864 – American Civil War: At the Battle of Globe Tavern, Union forces attempted to sever the Weldon Railroad during the Siege of Petersburg. 1891 – A hurricane struck Martinique, killing about 700 people, injuring at least 1,000 others, and obliterating houses, trees, and crops across the entire island. 1966 – Vietnam War: Members from D Company of the 6th Battalion of the Royal Australian Regiment were surrounded and attacked on all sides by a much larger Viet Cong unit at the Battle of Long Tan (RAAF helicopter pictured), but held them off for several hours until reinforcements arrived. 1989 – Leading Colombian presidential candidate Luis Carlos Galán was assassinated during a public demonstration in the town of Soacha, Cundinamarca. A male Australian shelduck (Tadorna tadornoides) in Perth, Western Australia. 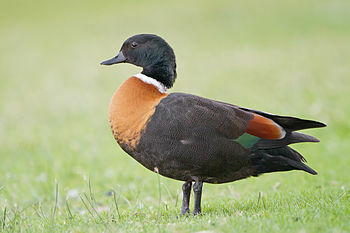 First described in 1828, this species of shelduck is sexually dimorphic: males are larger than females and do not have a white ring around their eyes. This Wikipedia is written in English. Started in 2001 (2001), it currently contains 4,583,740 articles. Many other Wikipedias are available; some of the largest are listed below. This page was last modified on 4 July 2014 at 00:24.